March 17, 2018 at 9:11 am PDT May contain affiliate links. Read disclosure. Hello! I uploaded a video of deals at Target and CVS this week (week 3/11 – 3/17). Note that some of the deals mentioned in the video will end by 3/17. Click on the above video (or click here) to watch it. Scroll down to see notes from this video. 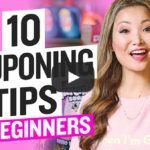 If you are new to Couponing in general, check out my Video Couponing Class Here. ONLY $9.99 (Reg $20) – as low as $9.49 for REDcard holders! ONLY $19.99 (Reg $40) – as low as $18.99 for REDcard holders! (March 20th Only) Head over to a participating Dairy Queen restaurant (excluding mall locations) where you can score FREE Small Vanilla Soft Serve Ice Cream Cone! No purchase is necessary, limit 1 per customer. The Fourth Annual Free Cone Day is a fundraiser for the Children’s Miracle Network Hospitals, so consider making a donation while you’re there! Enjoy your ice cream!